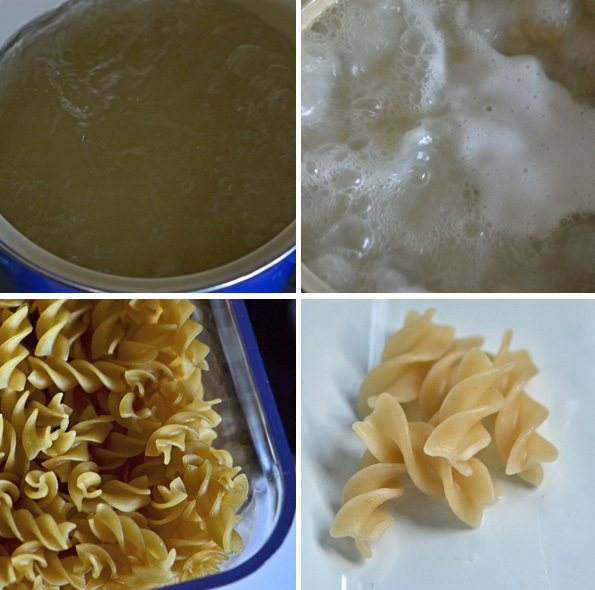 Home > Basics > How To Boil Gluten-Free Pasta—the right way! You know how a recipe for a pasta dish will always say, “cook the pasta according to package directions”? Yeah. Forget that. I bet the package itself says “cook the pasta according to package directions.” I don’t know, though. I haven’t looked in, like, forever. I have made so much gluten-free pasta over the years that I have become quite the insufferable braggart about the whole business. I want to show you how to make the most gorgeous, lighter and healthier feel-better-serving-it-to-your-family-every-Tuesday-even-in-New-Year’s-Resolution-season sort of gluten-free macaroni and cheese. But first? First, you’re gonna need your very own bragging rights. You need to know how-to boil gluten-free pasta so it’s perfectly al dente, not at all gummy, and holds up as good as or better than any gluteny dried pasta you’ve ever had. It’s all about the rolling boil, the foaming pasta water, the changing color of the pasta, and then the rinsing. Do this tonight, and you’ll feel like a rock star. Trust me. I’m a professional (told you about the bragging). Bring water to a rolling boil in a large pot over high heat. Set a couple pieces of the dried pasta aside to help you recall the color of it dried. Add the salt to the pot, followed by the remaining dried pasta. Stir to combine and to make sure none of the pasta is sticking to the bottom of the pot (or to itself). Continue to boil on high heat, stirring occasionally, until the water returns to a rolling boil (about 2 minutes), and then begins to bubble vigorously and to foam (another 5 to 7 minutes, depending upon the size & shape of the pasta). Turn down the flame a bit if necessary to keep the pot from boiling over. Once the pasta water has foamed considerably, begin stirring the pasta more frequently and checking the color of the pasta. Once it has lightened in color (usually another 2 minutes), test a piece to ensure it has no dry center but is still a bit firm. At that moment, remove the pot from the heat and drain off all the pasta water. Rinse the pasta thoroughly with warm tap water (or cold tap water if you are serving the pasta cold), then toss with oil or butter to ensure that the pasta doesn’t stick to itself. If not serving immediately, place into a lightly oiled bowl and cover tightly with plastic wrap until ready to serve. Store any leftovers in a tightly sealed container in the refrigerator. Can be reheated in the microwave. I’ve been cooking Tinkyada pasta using the ‘energy saving’ instructions, with results that can best be described as ‘meh’. Tonight I switched over to your method and waited to see if my two youngest (who are GF along with me) would notice. After a couple of bites, my six year old announced, “This pasta is different…”. Uh-oh. Good different, or bad different…? “GOOD different!” Nine year old agreed (although it was a bit too salty for his – and my – taste) – thanks for making a dinner staple around here much tastier! Hello-I am qutie a newbie to the gf world…I have several casserole recipes that you do not need to cook your regular pasta before hand…you mix it and bake it….will this method work with the gf pastas? Advice before I attempt this on my own is appreciated! I have a recipe on page 91 of my second cookbook, Gluten-Free on a Shoestring Quick & Easy, for Baked Egg Dinner in which I use uncooked GF pasta. It works well, but not in every recipe, I’m afraid. It does work in that one, though, of course! It requires a high ratio of liquid:dried pasta, and it has to be covered for a while in the oven so it can cook the pasta through. I just made Mac & cheese (& ham) the other night and had only one serving left! My family is only four, but two (non- gf) friends joined for dinner that night and raved about it. Thank you for all of your hard work and delicious recipes. I’ve discovered the secret to making GF pasta at my house is to add a tablespoon of oil to the water before it boils. And I make sure to use a large pan so the pasta can toss around freely. (I don’t rinse the pasta after cooking when I do it this way, nor do I add more oil after draining… Win-win!) My kiddos prefer GF pasta over wheat pasta now – something I never expected to happen!!! Before going GF we were pasta snobs – Amish egg noodles, Italian specialty pastas… Perfecting the texture was crucial – so glad it finally worked!!! I do the oil trick as well. Great post. Can you do one on maybe the best types of ff pasts for different meals. I still haven’t been able to find a pasts that works in a cold macaroni salad, in a couple hrs its either mush or hard again. Ive had great sucess with serving the True Roots brand Amaranth Pasta both hot and cold. When you cook your GF pasta the way I describe, it works well in a cold pasta salad. Believe it! Haha you crack me up. You’re such a brilliant writer :) so happy that I found your blog. I haven’t made gluten-free pasta in ages. I’ve been crazy addicted to zucchini pasta! But when I get sick of it, I’ll be sure to use your tips. I tried your pasta tips! Really did work, had excellent pasta with dinner tonight. Question having nothing to do with pasta. I just got a kitchen aid stand mixer for Hanukkah (finally!!). When making your bread recipes do you work with the paddle attachment or the bread hook? I can’t wait to try japanese milk bread! Hi, Meridith! So glad you were able to put the tips into action already, and that they worked for you! I must be one of the only people on the planet who likes SOFT pasta. If it’s got a bit of bite to it, it’s not done. I use bionature, and I cook it for 18 minutes. To me, this mimic’s a 12 minute normal spaghetti perfectly. It’s the same way I like my rice. Certain foods need to be soft. Disclaimer: I am an Irish Catholic originally from Boston, Salt and Pepper used to be exotic spices to me. I have been waiting for this post since you warned us it was coming weeks ago! I have not been satisfied with GF pasta at all, and now I know why! Thanks, Nicole! I’m afraid to say, Anneke, I think that promise was even months ago by now! I was so afraid I’d ruin the pasta while I was busy trying to take photos of it on the stove, which by the way is really too far away from the window to get good light so a good picture of something actually boiling is basically out of the question. So I just finally went with it, and lowered my normal photo standards for the sake of the pasta. For all the little pasta! I have just followed the directions. Thanks for this post. It’s very helpful! In my experience, there are also two reasons why things go awry in the kitchen, 1) The cook is not set up to do the whole task. The sink is not cleared to put a collander in, tongs or a slotted spoon aren’t immediately around to check the pasta during the cooking process, towels or pot holders aren’t at hand to grab the pasta as soon as it’s ready to drain. 2) The cook walks out of the kitchen to do something else( TV show, laundry,cell-phone chatting thus increasing the high probability of the pasta clumping,sticking on the bottom of the pot, nasty pasta water boiling over on to the stove/floor. You have to stay in the kitchen while cooking pasta. Period. Glean all the wisdom you can from this remarkable baker/chef/mom/wife and our friend,Nicole, who has spent years perfecting her craft! My Tinkyada directions say to bring the water back to a boil once you have put the pasta into it and let boil for 2 minutes then turn off, loosely cover and let sit for 15 to 20 minuted depending on the type of pasta. I have found that you don’t have to wait that long. I start checking the pasta at 15 minutes, the spaghetti even less time. Also of all the rice pastas I have tried Tinkyada never fails me. I’ve had good luck with this method, as well! LOOKING FOR SOME VEGAN YUMMY SOUPS……EASY?? QUICK? It’s never a good idea to use water from the hot tap for cooking or drinking. will you be making a kindle version of your book available???? Oh, Hannah, Hannah Hannah. I so wish I had a good answer for you. The kindle edition of my first cookbook has been unavailable since late September because I discovered that it had certain annoying errors. I am fairly certain the errors have been corrected, but my publisher’s ebooks department is giving priority to frontlist titles. That book has been out for 2 years, so it’s a backlist title. I’m so so sorry. I promise my editor is working working working on it and hopefully it will be resolved very soon! There is a lovely kindle edition of Gluten-Free on a Shoestring Quick & Easy, my second book, currently available, if you’d like to pick up a copy of that! I’m glad I got my Kindle Edition when I did. I do love making my Trench bread! It is exactly like French Bread. What’s a letter between friends? I just call it a secret recipe. How do you feel that this tastes the next day when it is a leftover? My experience with rice pasta is that it does not hold up well in the fridge for long periods of time OR am I cooking it wrong? Jennifer, I say this with l-o-v-e. It’s because you’re not cooking it my Super Special Way! Seriously, cook your pasta like this, and you will be able to enjoy it at room temperature, warm or even reheated in the microwave as leftovers. It won’t remain perfect for days on end in the refrig, but neither will conventional pasta. Try it! You’ll like it. I have found that it also takes a bigger pan. Especially with spaghetti noodles. The larger the pan the easier and better everything cooks. Your tips are right on though and have greatly improved my pasta dishes. Thank you! I have found that most of the corn pastas cook up and maintain a more traditional pasta taste and texture. The corn pasta doesn’t get mushy and can be used in a baked pasta dish (such as mac and cheese) just fine. Pasta was a big deal when I went gluten free and I was happy to find an Italian brand that tastes better than regular pasta to me. Since then, American brands have really started to catch up with great corn pasta. Agreed. Also have been really happy with the quinoa past. I believe it’s corn-based but has the added nutrients from quinoa and cooks great! I also agree – we stick to Corn and Quiona pastas because they hold up better and taste better when is a ‘left over’. JOHN: what brand do you use? My favorite, but unfortunately most expensive is Le Veneziane from Italy. They have so many different shapes. Even smaller types for macaroni salad or tiny ones for soups. It is pricy so I order large quantities to cut shipping costs. Surprisingly I have found tasty corn pastas at trader joes and Walmart (who would’ve thought) in my area. I have found that most corn pastas are pretty similar, it is just nice to have different shapes and sizes for different recipes. I like bi-aglut from Italy. It is a Heinz product, but I find it difficult to find…wonderful for cold pasta salads and is basically corn. My main issue with the GF pastas is that they don’t seem to work well in salads and, as someone who lives in the hot and sticky South, pasta salads used to be a main stay of our Summer. A perfect pasta hot is too hard cold. I need to be able to make a salad in the morning, before things heat up, to serve that night…any ideas? Yes! Cyn, if you use this method, you can serve the pasta cold! It won’t be hard. It is a pasta miracle! Seriously. I wouldn’t joke about such things. I’d lose my bragging rights. Try bi-aglut. I love their pasta for cold pasta salad and it holds up for days…I have issues trying to find it though and end up at the pricey gf store.. I agree! Gluten free pasta is a difficult one to master. Another trick,that many Italians use, is instead of mixing in oil at the end, mix in a scoop full or two of sauce. That way it doesn’t stick and you are adding flavour. That’s how we do it in my Italian home! I do that from time to time as well, Marion. But sometimes, I’m not serving the pasta with sauce – or I want to be able to serve it more than one way. Thanks for chiming in!